After 1974, when Neill James, the Grande Dame of Ajijic, closed her store and retired, the wonderful gardens of her home – Quinta Tzintzuntzan – were no longer normally open to the public. However, in 1977, James agreed to open her grounds every Sunday afternoon as an art garden (jardín del arte) for a new artists’ group, the Young Painters of Ajijic (Jovenes Pintores de Ajijic). Most of these young artists had started out by taking the free weekly classes at the children’s libraries James had started. Those classes were the very beginning of the very successful Children’s Art Program, now run by the Lake Chapala Society. Pintores Jovenes de Ajijic. 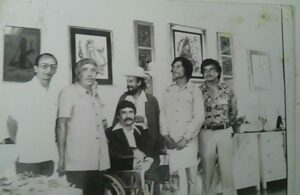 Standing (l to r): Javier Garabito Tovar, ?, ?, Dionicio Morales López, José Manuel Castañeda; seated: Félix Vargas. Credit: Dionicio Morales. The members of Young Artists of Ajijic included organizer Dionicio Morales López, Antonio López Vega, Daniel Palma Pérez, Julián Pulido Pedrosa, José Manuel Castañeda, Alejandro Martínez and Victoria Corona. The first show by the Young Painters of Ajijic was held from 11.30am to 4.30pm on Sunday 28 August 1977. The show included oils, acrylics, watercolors, charcoal drawings and prints, and the artists had combined sales totaling over $12,000 pesos ($550). Exhibitors at the event, besides those named above, included Antonio Cárdenas Perales and Victor Romero. Entertainment was provided by the Folkloric Dance Group of Ajijic and the wind music group of Luis López. 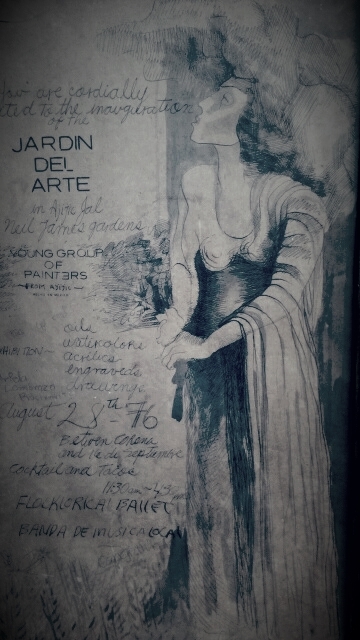 The Sunday “garden of art” shows were a regular weekly event for some time. The first non-Mexicans to exhibit with the group were Diana Powell and Sid Schwartzman. The following year, in mid-March, the artists held what was billed as Ajijic’s “first annual cultural week” in the gardens, with art exhibits, guitar concerts and ballet recitals, among other attractions. On this occasion, the entertainment included the Folkloric Dance Group of the University of Guadalajara (directed by Rafael Zamarripa), concerts performed by the U. de G.’s School of Music and a group conducted by Javier Garabito Tovar (standing on the left of the photo), as well as a stage play – “El Demonio Azul” (The Blue Devil) – directed by Félix Vargas (seated in the wheelchair in the photo). Despite hopes for a repeat event the following year, sadly the 1978 week-long show was the only “Ajijic cultural week” ever held. The Young Artists Group was the forerunner of the Asociación de Artistas de Ajijic (AAA). My sincere thanks to Dionicio Morales and Antonio López Vega for generously sharing their memories of the Ajijic Young Artists Group. 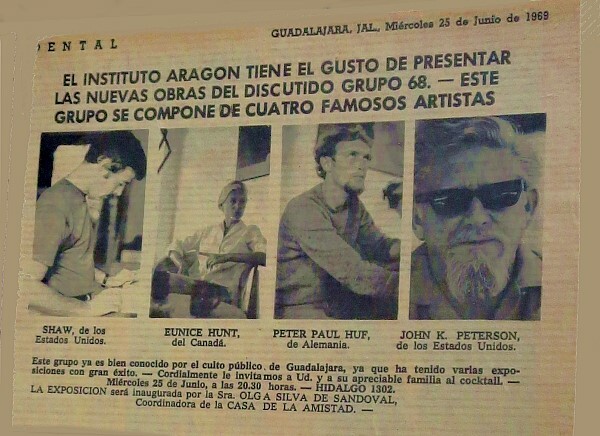 Guadalajara Reporter, 13 August 1977, 10 September 1977, 8 April 1978. Comments, corrections or additional material related to any of the writers and artists featured in our series of mini-bios are welcome. Please use the comments feature at the bottom of individual posts, or email us. The Clique Ajijic was a group of eight artists that existed as a loosely-organized collective for three or four years in the mid-1970s. 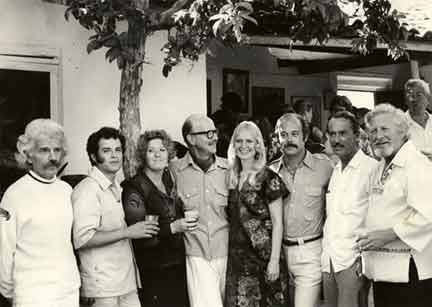 The eight artists in the Clique Ajijic were (from left to right): Sidney Schwartzman, Adolfo Riestra, Gail Michaels, Hubert Harmon, Synnove (Shaffer) Pettersen, Tom Faloon, Todd (“Rocky”) Karns, and John Peterson (the only member of Clique Ajijic who had been a member of the earlier Grupo 68). See also: Photo of Clique Ajijic and friends at Galería OM, 24 October 1975. Synnove Pettersen recalls that “We never painted together as a group, just had shows.” Some of these shows were organized by Katie Goodridge Ingram who ran the Galería del Lago art gallery, located at that time on the main highway in Ajijic. Tom Faloon recalled that Kate Karns, the wife of Todd Karns, sometimes posed for the artists in Clique Ajijic. Synnove Pettersen (e-mail exchange); Tom Faloon (interviewed in Ajijic in February 2014); Katie Goodridge Ingram (e-mails and telephone interviews, 2015); gallery invitations.